As a trader, you are dependent on your computer. Your trading computer holds all the pertinent information about your business. No matter what the operating system, you need to back it up. You might be thinking about getting special software to make the task easier. But if you aren’t ready to take that step, or if you don’t like having your stuff in the cloud, and if you are using a Windows 10 system, you already have the tools available to fully back up your system and restore it in case of any problems. Let’s walk through the backup and restoration process. You should not keep your backup on your computer. It’s like keeping your fire insurance papers in your house. If the house burns down, you’ll lose the insurance papers. For your computer, you might lose all your files and folders if your computer is attacked or corrupted. So you need to save the backup to an external hard drive or cloud storage. Also, you need to make it a regular practice, so you always have a recent copy. Infrequent backups can make your efforts useless. There is no benefit of having files and folders from two years ago. Your trading computer is an asset. Protect it with regular and reliable backups. Open the Control Panel and click on System and Security. Find Backup and Restore (Windows 7). This feature was implemented in Windows 7. That’s why Windows 10 doesn’t advertise it. You’ll find the Create a system image on the left side of the screen. Click on it. You’ll find the options – On a hard disk, On one or more DVDs, and On a network location. Choose a location that is appropriate for you. Next, click on the Start backup button on the bottom right corner of the screen. Your trading computer will start to create the backup. Depending on your system speed and your installation options, it can take a long time. If you are using DVDs, you might be asked to enter multiple DVDs. DVDs are not convenient for backup. On the other hand, cloud storage has the risk of exposing your information unless you use a cloud service that has encryption. Local external hard drives are probably the best option for storing your backup. Before you buy an external hard drive, look at the size of your initial backup and calculate the size you’ll need. The hard disk should be large enough to accommodate multiple backups. It’s not practical to store all your backups. Depending on what you store on your trading computer, you can determine if you should save weeks or months worth of backups. You can delete the older ones. This way you can optimize the use of your external hard disk. 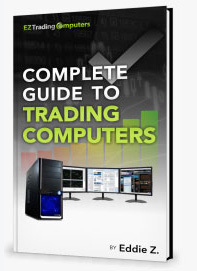 If you run into a problem with your trading computer, you can use the image you created to restore the system. The process of restoring Windows 10 is complicated. Depending on the problem, you might have to take various paths. You’ll need the help of a qualified IT professional to help you restore your system. Make sure you tell the IT personnel that you have full-system backups. If you own one of our EZ Trading Computers, help with system restoration is included with the lifetime tech support that comes with every one of our computers. Our philosophy has always been to manage risks. We do that with the EZBreakouts trading system we teach. And we do it with the data on our trading computers. We recommend you do likewise. Having a full-system backup will give you peace of mind knowing your trading business is protected from incurring large data losses. If you aren’t backing up your trading computer already, put it on your to-do list now.